What is the "Ride on Red" law? Simply put, it allows for any vehicle (car, bicycle, motorcycle or otherwise) to proceed with caution at an intersection if the traffic signal's vehicle-detection system fails to recognize it. The signal should be treated like a stop sign in this scenario. It's important to note, however, that this DOES NOT mean you can treat any red light as a stop sign — it must be malfunctioning. 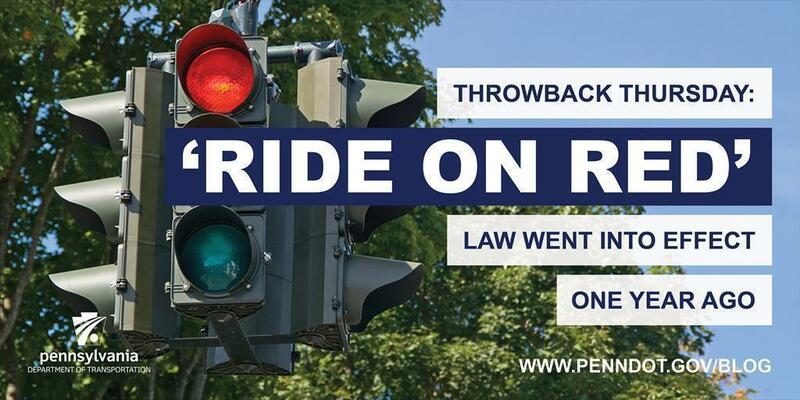 The specific law is silent on how long a motorist must be sitting at a red light before it's considered to be malfunctioning, but PennDOT and the Pennsylvania State Police encourage you to use common sense. The signal has to obviously be malfunctioning, either totally dark or frozen in the red mode (or go through several cycles without giving you a green light). Prior to the 2016 amendment, the law merely allowed for motorists to treat signals that were not operating as stop signs. The amendment added language that specified inoperability could be caused by traffic signals that use inductive loop sensors or automated technology to detect the presence of vehicles. Often, lighter-weight vehicles had trouble at intersections using this technology because they would fail to detect the vehicles, resulting in the light never changing to allow the vehicle through. The complete law can be found in Pennsylvania's Title 75, Section 3112(c).